Become a season ticket holder to experience inspiring LIVE music ALL season long! We offer a variety of season ticket packages to fit your schedule, lifestyle, and interests. As a season ticket holder, you will enjoy these benefits! The best seats in the house: Choose and keep the same seats for every concert. Substantial savings: All season tickets are discounted from single ticket prices. Single Ticket Discounts: Receive discounts on all additional single tickets purchased to all ISO concerts. Ticket exchange: At least 24 hours before the concert, exchange your Illinois Symphony Orchestra or Illinois Symphony Chamber Orchestra season ticket for similar concert, for another date, for any reason, in either city. You pay only the box office processing fees. Tax deduction: If you cannot use your ticket, return it to the venue box office at least 24 hours before the concert and a receipt for a tax-deductible contribution will be mailed to you. ALL Season ticket holders enjoy substantial savings off of our full price tickets. This season enjoy 50% off full price single tickets for first-time season ticket holders and 25% off season tickets to all those who took advantage of our first-time season ticket offer during the 2017-2018 season. Experience it all! Includes 4 Symphony concerts (S), 2 Pops concerts (P), and 2 Chamber concerts (C). Includes 4 Symphony concerts (S) and 2 Pops concerts (P). Includes 4 Symphony concerts (S) and 2 Chamber Orchestra concerts (C). Includes 4 Symphony concerts (S) and 1 Pops concert (P). Includes 2 Pops concerts (P). * Special promotional pricing available in Price Levels 1 & 2 and valid for those who have not purchased season tickets since 13/14 season. ** Special promotional pricing available in Price Levels 1 & 2 and valid for those who were first time season ticket holders during the 2017-2018 season. Lock in the savings for your next visit without having to be locked into a date! Flexi Tickets are just that: flexible. Flexi tickets come in packages of 4, 6, and 8 tickets and may be used over multiple concerts throughout the season or you can use them all at one concert and bring a group of friends. Flexi Tickets may be exchanged in advance or the night of the performance for the best available seats located in Price levels 2 and 3 for the concert of your choice (subject to availability). They are not valid for any special event and they do not qualify for any special promotional pricing. 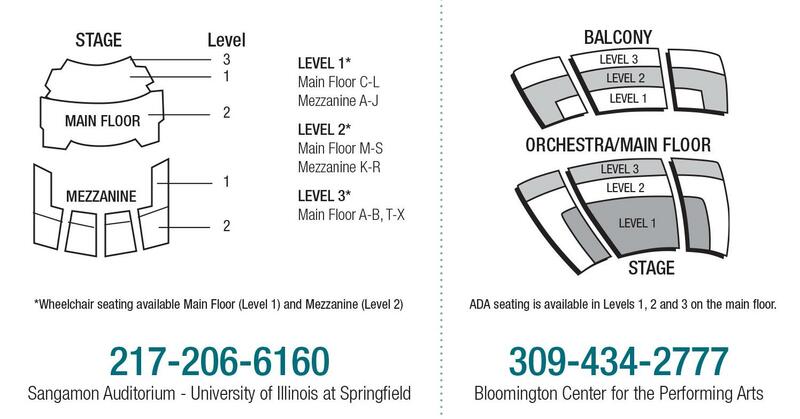 All Illinois Symphony Orchestra venues provide special seating and assistance for patrons in wheelchairs. Please notify the box office of any special needs when purchasing your tickets. Refunds are given only in the event of concert cancellation or date change. Handling fees are not refundable. Programs subject to change. Concerts Around the Town Concerts Guild Events Special Events Group Tickets Season & Flexi tickets New York, New York...What a Wonderful Town!